Organic molecules can be very large and are sometimes also extremely complicated. Isomerism: The same combination of atoms can be attached together in different ways (isomers), resulting in different chemicals that have different properties. For this reason correctly stating the numbers of each type of atom in a molecule of a compound is sometimes insufficient to uniquely identify the compound. 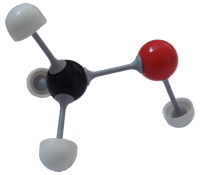 Bond angles and hence the 3-dimensional structure of organic molecules can also be important. It is useful to be able to label the different ways of representing (including drawing) organic molecules and to recognise and be able to give examples of each. Why ? Knowing the names of different types of chemical formulae is useful for communication, e.g. when discussing or giving or receiving instructions about chemistry, especially verbally or in writing (rather than via diagrams). Molecular formulae will already be familiar from the short-hand way used to represent chemical compounds in school-level inorganic chemistry. In organic chemistry a molecular formula just states the numbers of each type of atom present in a molecule, without providing any information about the way those atoms are arranged or joined together. Because they do not include details of the bonding within the molecule, molecular formulae are rarely sufficient in organic chemistry. When molecular structures are used in organic chemistry it tends to be to describe the reactions of relatively simple molecules, e.g. combustion of hydrocarbons. Where the purpose is obviously to describe a simple reaction rather than to consider the organic molecule itself in any detail. In contrast to molecular formulae, structural formulae do illustrate how the atoms are joined together by various (single, double or triple) chemical bonds. There are several different types of structural formulae. They show different levels of detail and types of information, e.g. all the individual bonds (or not), approx. bond-angles (or not), representation in 2-dimensions or 3-dimensions (albeit often on 2D paper or computer screens, but sometimes as physical 3D models). The different types of structural formulae of organic molecules are listed and defined below, with simple examples of each. Further information about these different representations of the structural formulae of organic molecules is included on more detailed pages about each - see links after each section. Fully Displayed Formulae are the opposite of simple Molecular Formulae because, while molecular formulae give no information about the molecular structure and bond types, fully displayed formulae include every atom in the molecule identified individually by its atomic symbol and every bond between atoms drawn in full so that it is possible to see which atoms are connected to which other atoms and by which type (single, double or triple) of covalent bond. Use of fully displayed formulae is very helpful when first studying organic chemistry and gaining practice working out molecular structures using the rules about how many other atoms each type of atom connects to, which bonds can be double or triple bonds, and so on. However, drawing out fully displayed formulae is not always necessary and can be impractical in the cases of molecules that exceed a certain size and complexity. In such situations simplified displayed formulae and skeletal formulae may be more appropriate. Displayed molecular formulae can be simplified for ease, speed, space and clarity by grouping together the hydrogen atoms attached to each carbon atom in the chain(s). Functional groups attached to the molecule are often still drawn in full as these are important parts of the molecule, frequently responsible for its key properties - including reactions. Depending on the level of 'simplification', single covalent bonds between adjacent carbon atoms in a chain or branch may, or may not, be shown (see examples below). Note that the molecules represented below are the same as those represented by fully displayed formulae (above). A simple example of a 3D Structural Formula is that for methane, whose molecular formula is CH4. Although it is useful to be able to draw 3D molecular structures of organic compounds, these diagrams can quickly become cumbersome and difficult to draw clearly. You are unlikely to have to draw 3D molecular structures of very complicated molecules for school chemistry tests. A common use of this type of representation of molecular structures is to explain isomerism, and optical isomerism in particular. See also How to Draw Organic Molecules in 3D. Teaching institutions such as schools, colleges and universities have used 'ball and stick' models to teach and explain organic chemistry for many years. Such learning tools are also available to purchase (online or in academic bookshops) for personal study. More recently computer software has also become available to enable students and professional chemists to create and view computer-generated images of molecular structures that can be rotated in '3D space' on a computer screen or interactive whiteboard. Both the physical and software versions of chemistry 'ball and stick' models are useful for understanding and communicating molecular structures. 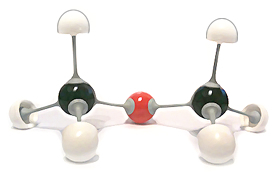 See also 3D Models of Organic Molecules (to be added). In organic chemistry skeletal formulae are the most abbreviated diagrammatic descriptions of molecules in common use. They look very bare because the hydrogen atoms (attached directly to carbons) are not shown, resulting in the appearance of just a 'carbon skeleton' with functional groups attached to it. This type of representation of organic molecules is most frequently used in more advanced texts, research papers, and specialist areas. 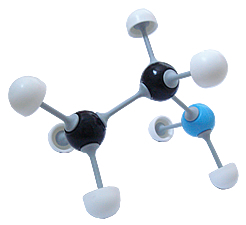 It is generally the most practical way to draw large and very complicated organic molecules. Even at lower levels of complexity (e.g. High School Chemistry and UK A-Level) skeletal formulae may be used, especially when studying and describing structures involving carbon rings, such as cycohexane and benzene. Note that the molecules represented below are the same as those represented by fully displayed formulae (above, Section 1) and simplified displayed formulae (above, Section 2). Note that the hydrogen atoms are present in the molecules but in skeletal formulae their presence is assumed, rather than drawn or stated explicitly. See also How to draw Skeletal Formulae of Organic Molecules.